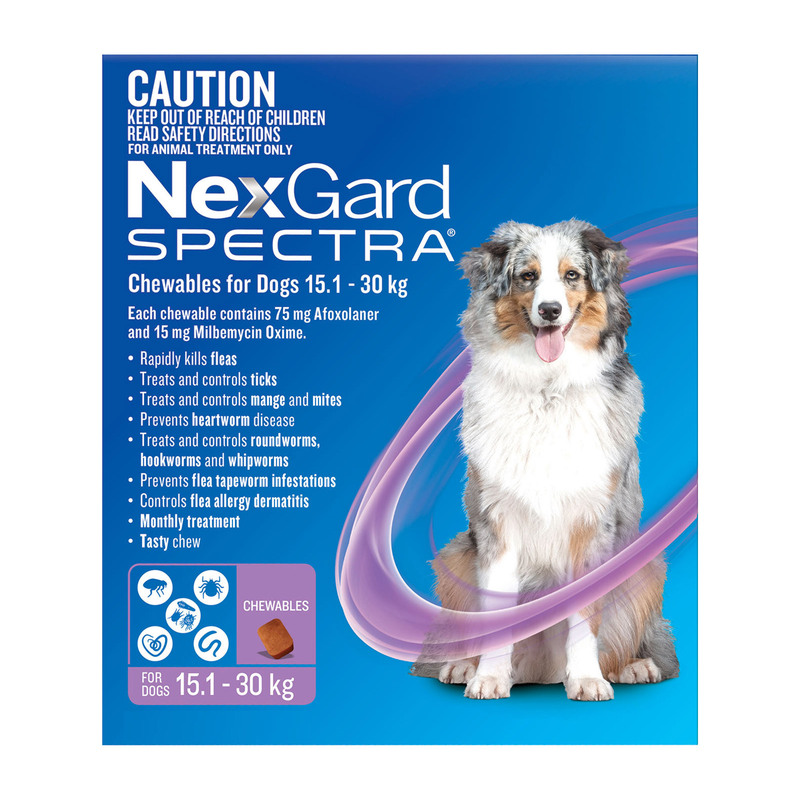 Nexgard Spectra is a chewable tablet used for the treatment of fleas and ticks as well as prevention of heartworm disease in dogs. The oral tablet is also useful for the treatment of gut worms including roundworms and whipworms. The regular treatment also provides protection against the risk of zoonotic hookworm, Ancylostoma ceylanicum, a parasite which can infect humans. The oral treatment further prevents flea tapeworm infection in dogs. It gives protection against fleas for up to five weeks and controls ticks for up to four weeks. 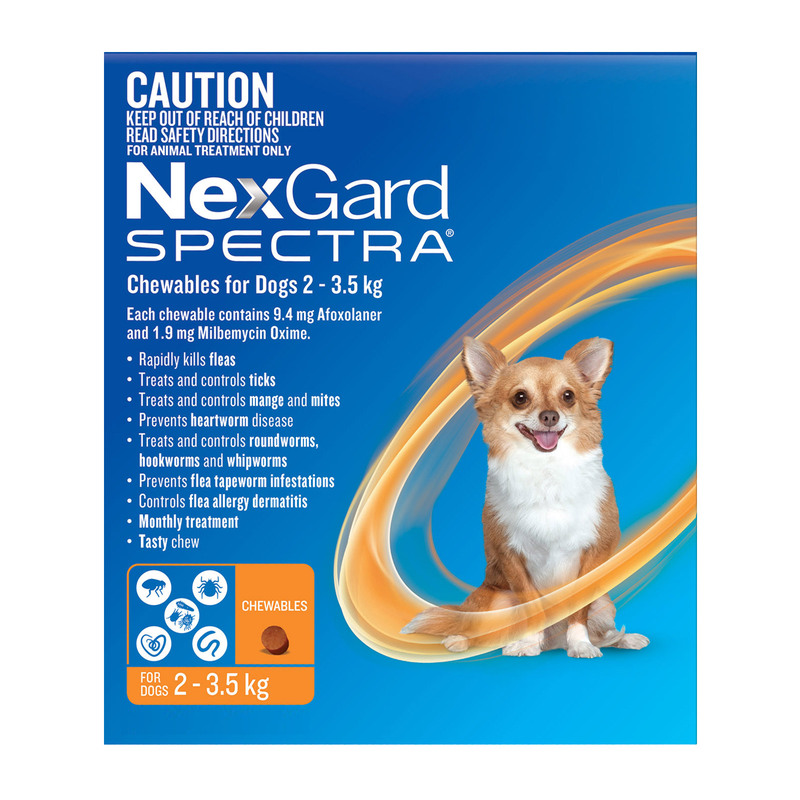 Nexgard Spectra is also potent in controlling ear mites, demodectic mange, sarcoptic mange and otodectic mange. The monthly treatment is a highly palatable chew and easy to administer. The broad spectrum treatment controls most of the external and internal parasites in dogs. 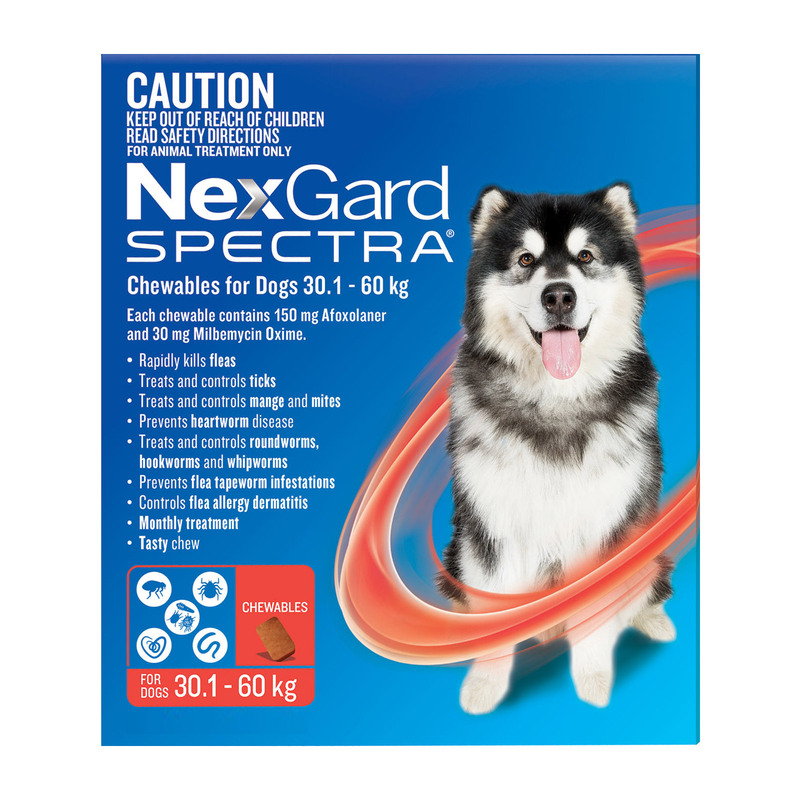 Nexgard Spectra Chewable Tablet contains two powerful ingredients – Milbemycin Oxime and Afoxolaner. The active ingredient Afoxolaner is an insecticide and acaricide. It kills fleas before egg production and prevents household from heavy flea contamination. Afoxolaner kills adult fleas as well as adult ticks. It can be used for the treatment strategy of flea allergy dermatitis. The other ingredient Milbemycin oxime is an antiparasitic endectocide. It kills intestinal worms and immature form of heartworms. 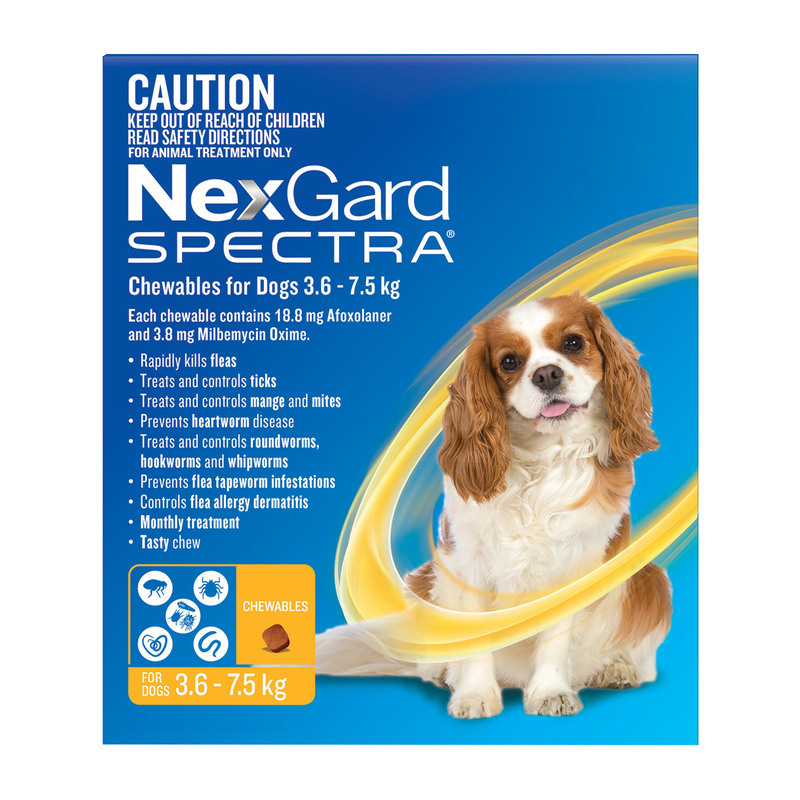 Nexgard Spectra Dogs interferes with the way that signals are passed between nerve cells (neurotransmission) in the nervous system of parasites, resulting in paralysis and elimination of the parasites. Monthly treatment protects dogs from the multiple parasitic infestation. 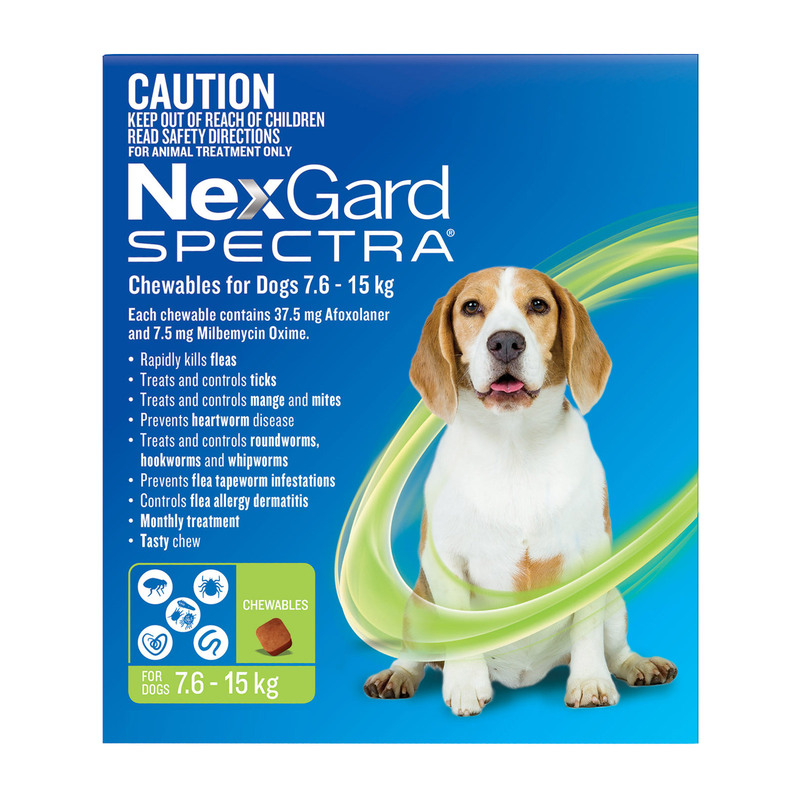 Nexgard Spectra has been facing stock issues across Australia. One tablet dose should be given once a month depending on dog’s bodyweight. Very effective in killing hookworms. Kills fleas, ticks and mites within hours. I was amazed to see the dead fleas on my dog. She hasn't been infested again ever since I have started giving Nexgard Spectra as a regular monthly preventative.